Aqualife's Retreat spa is your own at home oasis. This spa gives you luxury in a durable unit with a low maintenance, impact resistant exterior. All 11 jets are powered by a two-speed energy efficient pump that allows you to have a quiet relaxing evening or melt away the day's aches and pains with the high-speed hydrotherapy setting. A digital back lit control unit allows you to customize your experience setting the mood while you enjoy your spa with up to four other people. This rotationally molded spa is made from quality granite resin that features a fully insulated interior allowing your spa to retain optimum heat from your all-season stainless-steel heater all year long. Ready to go right away with its featured PLUG & PLAY connection this spa will perform all year long. The Retreat spa also comes with a heavy duty, insulated tapered cover with locking clips that allows you to easily and comfortably close your spa to the elements. Please see enclosed warranty for more details. Combine luxury, style and affordability with Aqualife's Adulation spa. This spa can seat up to 6 people, complete with 2 captain's chairs and a full-body lounger. The acrylic shell houses 51 stainless two-tone jets and 16 stainless steel jets to give you maximum comfort from head to toe. Featuring a Bluetooth capable sound system with 2 speakers in the acrylic shell and a subwoofer housed inside the no maintenance exterior cabinet, your set to truly give you and your guests a completely customized experience with the Adulation spa. This energy efficient spa is powered by 240V with 3 high performance pumps allowing you to choose your level of relaxation. Delivering your heat is a powerful and efficient 4kW Balboa heater that will offer the comfort you want. The finishing touch to the Adulation spa is an insulated heavy-duty tapered cover, made a full inch thicker than industry standards, which will protect your spa from nature's elements. The St. Lawrence Swim Spa offers you the very best in aqua fitness with its unique jet system that provides controllable resistance for swimming and aqua-aerobics. This spa also includes an LED perimeter lighting system and pop-up waterproof speakers with an Mp3 player connection. The Santa Maria Spa comes equipped with 16 powerful stainless steel jets, a 1 kW heater, and an airflow control system that adds air to the jets for a more invigorating massage experience. Installation couldn't be any easier, simply fill the spa with a garden hose, plug the 15 ft. GFCI protected cord into any 120V/15 amp wall outlet, heat it up to 104 and jump in. And maintenance of this spa is a breeze too! The spa shell is an easy to care for Lucite Plus Acrylic, the cabinet is maintenance-free, and the pre-programmed filtering cycles keep spa water safe and clean. This unit also comes standard with an electronic topside control and a lockable hard cover. Retreat 11 Jet Cobblestone Standard Hot Tub PLUG & PLAY Aqualife's Retreat spa is your own at home oasis. This spa gives you luxury in a durable unit with a low maintenance, impact resistant exterior. All 11 jets are powered by a two-speed energy efficient pump that allows you to have a quiet relaxing evening or melt away the day's aches and pains with the high-speed hydrotherapy setting. A digital back lit control unit allows you to customize your experience setting the mood while you enjoy your spa with up to four other people. This rotationally molded spa is made from quality granite resin that features a fully insulated interior allowing your spa to retain optimum heat from your all-season stainless-steel heater all year long. Ready to go right away with its featured PLUG & PLAY connection this spa will perform all year long. The Retreat spa also comes with a heavy duty, insulated tapered cover with locking clips that allows you to easily and comfortably close your spa to the elements. 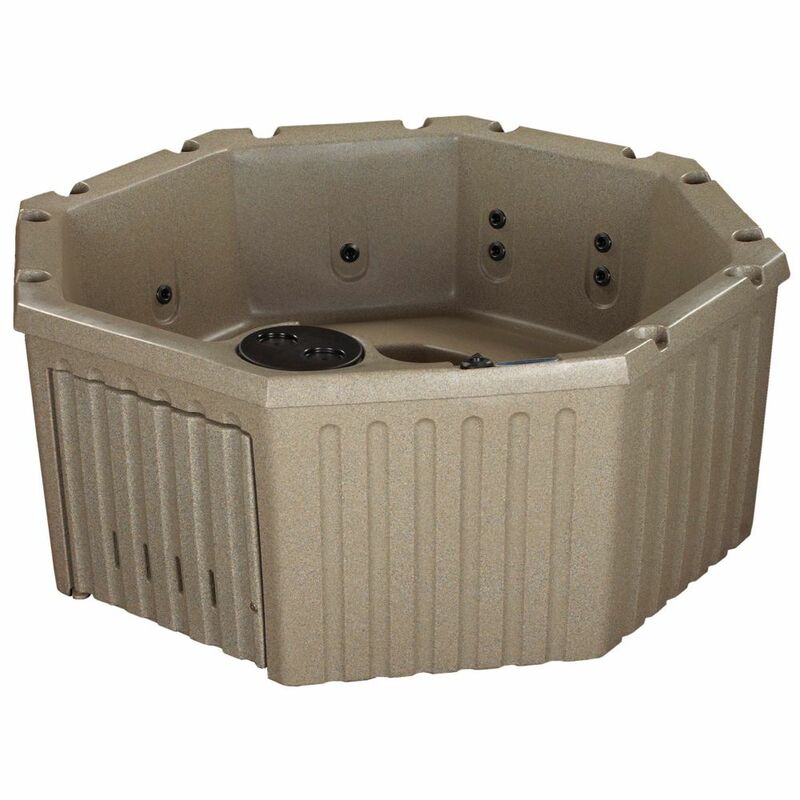 Retreat 11 Jet Cobblestone Standard Hot Tub PLUG & PLAY is rated 4.0 out of 5 by 2. Rated 4 out of 5 by Cazador66 from Great little spa Just love our new hot tub. Have been without one for a few yrs and forgot how much I missed it. Really forceful jets! Bought it mainly for the two of us and it is the perfect size. Would have to be really close friends or family to want to add more people. Arrived 10 days earlier than expected, so was a bonus. We had it hard wired to 220, so you can heat it at the same time the jets are on HIGH. Not sure if you can do that with just the plug n play. Our control panel ( jets , lights, heat) faces towards the outside of the tub, so if you want to adjust them while in the tub , everything is backwards. Not a big deal, but we change them more when we are in the tub than out. What is the noise level when running both in a resting position as well as a full power jets setting. Also is this able to withstand sub 0 temps in winter if in a covered but not enclosed area? This hot tub has a low noise level when operating in its heating or filtering cycle. Depending on the surface it is resting on, one will have to verify operation when right beside it. As for while jets are on high speed, the noise does increase, however casual conversion can be held while in the spa. This spa will maintain temperature in freezing conditions, however once the cover is opened the temperature will begin to drop. A 1kw heater is the maximum used in 120 volt hot tub, however if converted to 240 volts this heater will operate at 4kw and heat easily in colder conditions.